How to make: Prepare the veggies: wash, cut the top or side parts and remove the inside. For the zucchini, cut and throw up the edges but save the inside parts, cubed. For the peppers, be sure to remove all seeds. For the potatoes, cut a top part and a special tool to remove all but a bit more than a quarter inch thick shell (1/2 cm). If you use potatoes cut the removed part in cubes and save it. Add some salt to the inside parts of the veggies and let them drain upside down on a paper towel for about half hour. While they’re drying, take a big bowl and combine the cubed zucchini, tomato and potato parts, rice, onions, parsley or mint, salt and pepper. Stuff the veggies about 2/3 of the way to leave room for the rice to grow as it cooks. 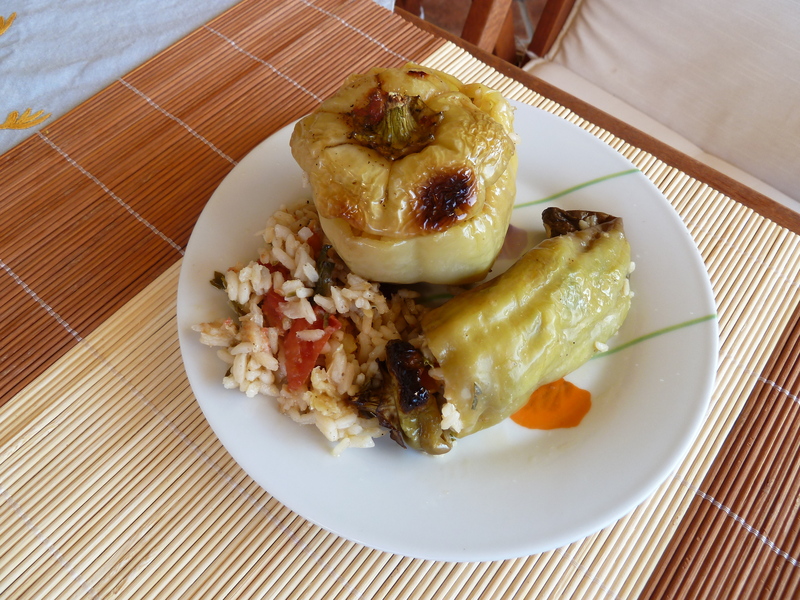 If you use vine leaves, put a teaspoon of the filling on each and fold. You will only need a teaspoon of filling for the zucchini flowers, too. Arrange the stuffed veggies in the pan and any remaining filling in between. Add salt and pepper. Sprinkle some olive oil on top. Add the grated tomato and the water. Cover the pan with aluminum foil and cook a pre-heated 320F/160C for about an hour and 15 minutes. Remove the aluminum foil and continue cooking for another 20 minutes or so. Check the filling to see if the rice is cooked. I had to add some water during cooking directly in the veggies to help the rice soften. Maybe because I used fewer veggies (with inside parts) which altered the proportion of rice to the other ingredients in the filling. Keep an eye to be sure and …bon appetite! Notes and tips: Everybody liked the recipe but to be honest I didn’t find it superior to the less stressful version I posted on “Stuffed tomatoes”. I get peace of mind when I cook the filling and then put the stuffed veggies in the oven only for softening and to get the flavors blended. But I know a lot of people who prefer cooking everything in the oven so pick what works best for you.